Earlier this week, Google started offering Google Glass in open beta. Anyone with $1500 can now buy the wearable device. And along with this change comes another major one for the connected specs. Google has named Ivy Ross as the new chief of Google Glass. Ross left a message on the Google+ site for Glass, talking about her past positions at companies like Calvin Klein, Swatch, Coach, Mattel, Bausch & Lomb, Gap and Art.com. At those firms., Ross said that she worked "at the intersection of design and marketing." Calling Glass "cool," she admitted to just getting started on the device. According to the post, which you can read in its entirety below, she will begin her career at Google starting on Monday. Considering that Ross' strengths seem to be in design and marketing, it would seem that the first phase of Google Glass is now over with the next phase to focus on selling the device to the public. 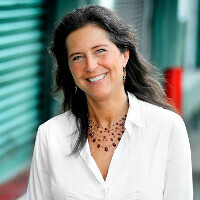 My name is Ivy Ross, and I’m excited to be joining Google on Monday, May 19 to lead our Glass efforts. With your help, I look forward to answering the seemingly simple, but truly audacious questions Glass poses: Can technology be something that frees us up and keeps us in the moment, rather than taking us out of it? Can it help us look up and out at the world around us, and the people who share it with us? I have spent my career--Calvin Klein, Swatch, Coach, Mattel, Bausch & Lomb, Gap and, most recently, Art.com--at the intersection of design and marketing, trying to answer questions like this in different ways, for different products. But Glass is especially cool, as no one has really tried to answer them with a product like this before. That’s our job, Explorers! I'm just getting started on Glass, but, because of all of you, and your thoughtful and smart feedback, I feel like I have an incredible head start. And I look forward to learning even more from you, and experiencing Glass together. Some woman who will sell anything for money. Google is the perfect job for her. try harder next time. I know Google's interviewers are a bit rude and search for the perfect person lol. Google business types don't go through the same sort of interviews as the technical types. Lets wait for actual retail pricing before we say it cost too much. Like I posted before....PS3 and PS4 dev kits were in the thousands before the consoles went retail.